Tire problems and high tire costs can be avoided by investing in the perfect TPMS reset tool. These tools can tell you instantly if there is a problem detected with your tires. In order to find the Tire Pressure Monitoring System reset tool that can help you, our team has reviewed the best of the best products. 2 Why Should I buy a good TPMS reset tool? 3 How do I use a TPMS Reset Tool? Now if you know the steps to use a TPMS reset tool, it is time to pick the best tool for you. If you’re still struggling to find the perfect tool for your vehicle, this review should give you all the answers you’re looking for. Take a look at the Top 10 TPMS reset tools of 2019, and decide for yourself if your tire health is worth the investment. We have broken it down into 3 easy ways to learn more about each tool. Most importantly, its compatibility with your car. This tool is the number one choice in the online market to date. It is one of the most popular choices on the market because of its low price and ease of use. Even a beginner user can navigate the ins and outs of this TPMS because it only takes a click of one button. With the VXDAS TPMS reset tool, the user is able to reset all 4 tires in just three easy steps. First, you set up the vehicle to make sure it is able to deliver TPMS information. From there, you can hold the device up against the tires and click the LEARN button to receive more information about the tire information. This particular device is best used for GM vehicles. 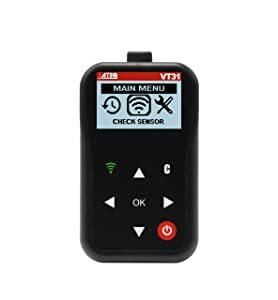 The VXDAS TPMS reset tool is set up to work with most GM vehicle from 2006 to 2019. This device is not compatible with any heavy duty truck. It is recommended that before purchase you should double check your vehicles compatibility with EL-50448. The JDIAG TPMS tool is a tool that is compatible with both GM and Ford vehicles. 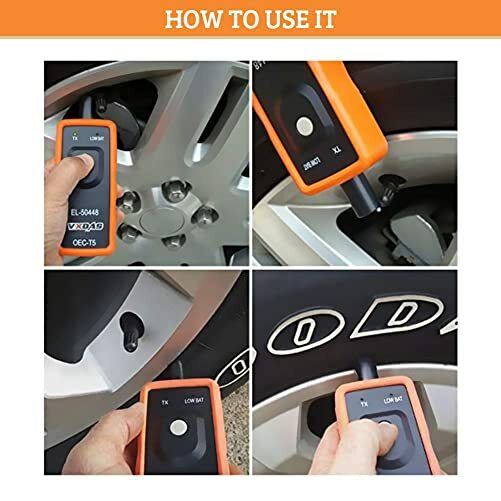 This tool is a perfect fit for monitoring tire pressure, resetting the TPMS light and exchanging tires. Similar to the VXDAS TPMS tool, the JDIAG Relearn tool can active the TPMS sensors with one click. All users will have the ability to navigate this device by resetting the tire pressure after maintenance. After the reset is done, the TPMS indicator light will turn off. JDIAG tpms tool is perfect for most car owners. The JDIAG TPMS relearn/reset tool has a wide coverage of vehicles. This tool is compatible with both GM vehicles and Ford model vehicles. It is important for users to double check their compatibility before purchase. For a higher price tag, this Autel TPMS Scan Tool can do a lot more than the previous one-touch scanners. The TS401 can receive vehicle information feedback from 4 different sensors on your car. That means, with this tool you can get Sensor ID, Tire Pressure, Battery information and Temperature from the tires. 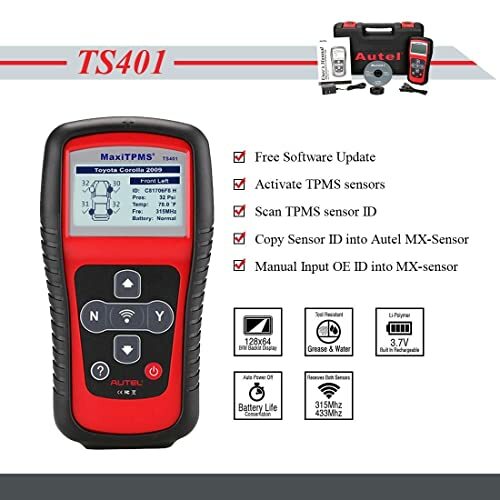 Autel TS401 could wirelessly activate any known OEM / Universal TPMS sensors to access to the fault TPMS sensors. However, users should note that this tool can read and reset the light but you may need a more advanced scanner for other procedures. With the purchase of this device, the user can expect one-tool to do all the relearning without looking up codes. Additionally, the Autel promise always comes equipped with a lifetime of free updates. As well, you don’t have to fear money lost, this tool has a 1-year warranty. Easy-to-Use- With a user-friendly format, anybody can figure this tool out. Reliable- Autel promises efficiency and warranty on all products. 4 system sensors- Tire Pressure, Temperature, Battery Power and Sensors. Lifetime Updates- Your tool can stay up to date with online software updates. This particular tool comes without the OBD2 cable. That being said, this device cannot read/erase TPMS system codes without the OBD2 cable. This tool works with most TPMS equipped vehicles from 2006 to the present day with TPMS. 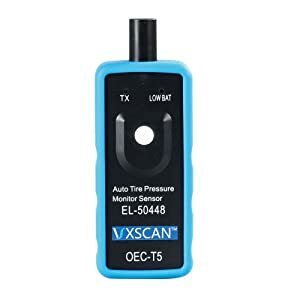 This sensor tool is uniquely designed and one of the more universal TPMS reset tools on the market. One of the great features about this tool is the one-touch interface that makes it perfect for any user. All it takes is positioning it next to your tires and it can communicate with the previously known sensors. This tool is essentially an advanced tire gauge with more information. With this tool, you can read about the sensor ID, battery information, and the absolute tire pressure. Regardless of if you are a beginner, DIYer or a shop owner, this tool can prove to be useful. Not updateable- Any vehicle after 2017 is not able to work with this tool. The ATEQ VT31 is compatible with most TPMS equipped vehicles up to 2017. Unfortunately, this tool is not updateable to include vehicles after 2017. This particular tool outshines the others with its features and functions. In comparison to the other scan tools on this list, this Autel MaxiTPMS tool is a bit pricier, but also more advanced. Instead of just TPMS sensor tests and resets, this tool can activate the OEM. In addition to that, this tool can clone ID sensors and reprogram sensors to the vehicles ECU. The large, color screen allows for everything to be displayed clearly so you can see the exact position of the problem. 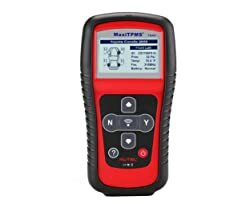 The Autel MaxiTPMS is easy to handle and can work as a basic sensor activation or a complex diagnostic tool. 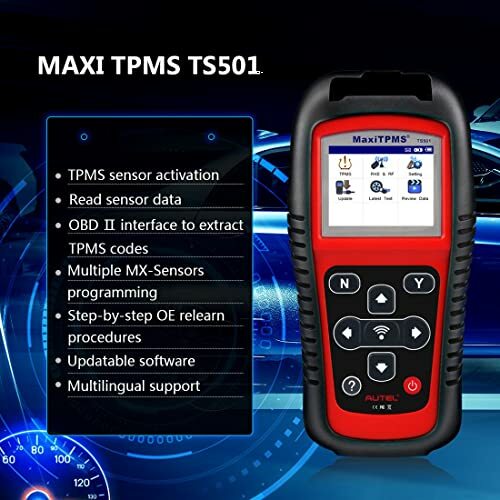 Maxi TPMS Ts501 features more functions. In other words, with the purchase of this device, you have a multitude of options. With clear code definitions that you can view visually on the screen or audio responses from the device, diagnostics will be a breeze. 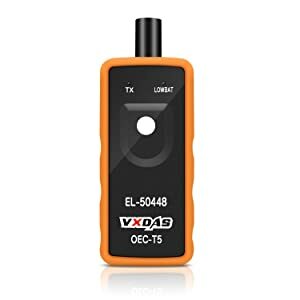 This tool can use the OBD2 connector cable to connect with the ECU on your vehicle. Easily display the relearn TPMS procedures and get started right away with this easy-to-use tool. If that is not convincing enough, this device comes with free software updates to keep all info up to date. Limited support- For the few users who had a problem with this device, the support team was not able to help. 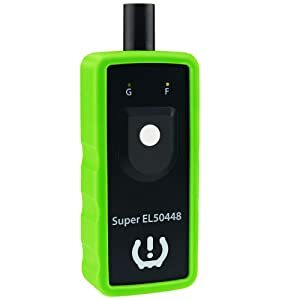 This device works with most EU, Asian and Us made vehicles for TPMS readings. That being said, before purchase it is smart to double check the compatibility of your vehicle with the Autel team. 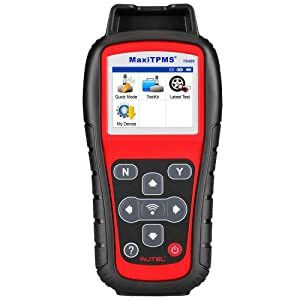 This tpms reset tool is a basic scan tool that falls in the below $20 price range. The VXSCAN EI-50448 TPMS Reset Tool can help you reset and reprogram your vehicle’s tires in 3 steps. First, put your vehicle in TPMS learn mode. Follow all service procedures and then hold this tool against the wall of your tire sensors. Click the learn button on the device and you can simply activate and test new tire sensors. You can take the pain and expense out of tire reset with this well-priced, easy-to-use tool. 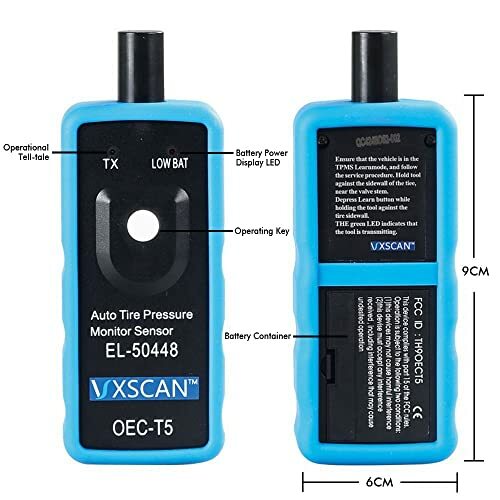 VXSCAN El-50448 TPMS reset tool can help you reprogram all tires easier with 3 steps. 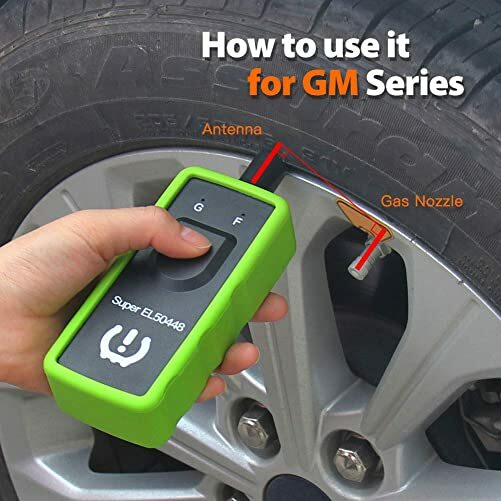 This tool is recommended for GM Series of vehicles from 2010-2013. The coverage for this device is quite low, so users should definitely take note before purchase. This specific GM tool is specific for helping with the relearn and replacement procedure. For most GM vehicles, after a tire rotation, a relearn procedure is mandatory to shut off the TPMS light. This is a basic scan tool that is only able to do TPMS Reset. The GM TPMS Reset tool is similar to other tools when it comes to the procedure process. It is a one-click tool that follow the steps of reading the tires with no more than one button. This tool works with a 9 volt battery, but the battery is not included with purchase. Furthermore, this device is not equipped with an on/off switch, so it is recommended to remove the battery after each use. The GM Tire Pressure can work on models from 2012 and onward. The tire relearn procedure can only be used on a select few GM models. 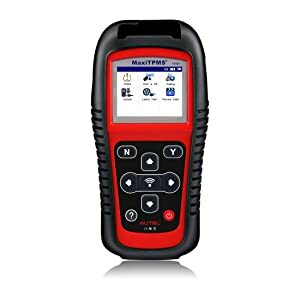 The Autel MaxiTPMS TS601 is more than just a TPMS Diagnostic Tool. This tool also functions as an all included OBD2 Automotive scanner. Therefore, this device can do more than just relearn and reprogram the tire sensors after a tire rotation. 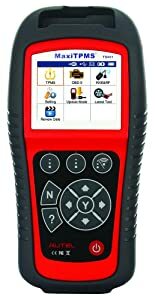 For a larger price, this tool has the capabilities to read DTCs, receive tire pressure information, read live data and more. With freeze frame data, you can be well informed about exactly where the problem occurs. Additionally, this tool works as a programming system for Autel MX- Sensors. In comparison with other devices, this tool goes above and beyond the rest and gives accurate OBD2 reads. You will have access to save, display and print live vehicle reports from this device. Essentially, this is a fully functioning OBD2 scanner with accurate and efficient TPMS reading functions and programming. The perfect tool for anyone in a workshop or experience reading/clearing trouble codes. 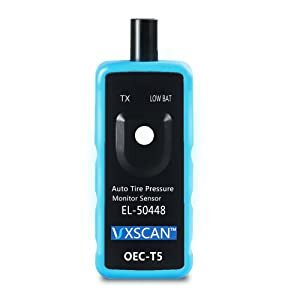 This is a great Autoscanner for anybody with experience working with cars or tire repairs. The Autel MaxiTPMS TS601 works with GM vehicles, Ford, VW, Audi and Benz. One of the hardest parts of picking out a TPMS reset tool, is finding the perfect fit for your vehicle. The VXSCAN team has created a series of one-touch reset tools that can fit any budget. These particular tools all are similar in their configuration but differ based on their vehicle compatibility. At the beginning of this article, our team gave a guided review of how to work with the one-touch tools. Once again, this VXSCAN tool makes the list of our top 10 tools based on the ease-of-use and unbeatable price. This tool is equipped with a TPM system that works with EL-50448 to reset the new tires. Similar to the other tools, this device functions with one-touch technology when the vehicle is in relearn mode. 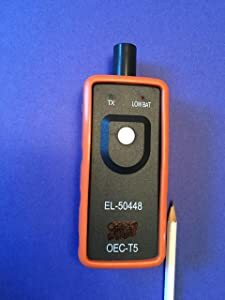 The EL-50448 works with all General Motors vehicles that are manufactured in North America. This tool works for both cars and trucks. That includes Buick, Cadillac, GMC and more. The TS408 can read/activate 98% of all known sensors. The last and final product on our list is the Autel TS408, which is an upgrade from the Autel TS401. This hand-held TPMS Service Tool can read the sensor IDs, give battery life information, as well as tire pressure and tire temperature. Additionally, this tool can program MX-sensors to replace previous OE sensors. Autel is a reputable brand that makes smart devices to help with every need. As well, this tool is backed by the Autel promise for free lifetime updates to keep the software current. The graphic display is laid out in an easy to read format to give even the advanced mechanic an easy read. This model the TS408 is designed to read all TMPS sensors. It is a great tool for reading and programming information for your vehicle. The TS408 by Autel can provide clear reads straight from the engine. Instead of messing with internet code definitions, this tool gives it all to you with a few clicks. Lucky for all users, this device is compatible with a wide range of vehicles. Autel promises that if you own a European, U.S or Asian made vehicle with TPMS, the TS408 will be compatible. That’s a big promise, but with a reputable team like Autel, everyone should find what they are looking for in this device. Why Should I buy a good TPMS reset tool? Your vehicle is equipped with a Tire Pressure Monitoring System in order to keep you safe. Nowadays, all cars have TPMS to comply with the laws for vehicle inspections. The system itself is a safety measure to ensure the driver knows if their vehicles’ tires are over or under inflated. Although the vehicle standards have changed and most cars have a TPMS installed, there are still some vehicles without it. To avoid tire-related accidents or the high costs of replacing all tires, it is recommended that all drivers use a TPMS scan tool. If you invest in a tire pressure monitoring system scan tool, you can avoid the risk of a tire-related accident while driving. A TPMS reset tool will be the greatest partner to double check your tires and reset all sensors after a change. But first, some of you may not know how to read the TPMS with a one-click tool. How do I use a TPMS Reset Tool? As you will come to find out, many of the TPMS tools on our list are easy to use and function with just one-button click. However, not all readers may know the standard procedures for beginning the relearning process. Don’t worry, that is what we are here to help with. As you will come to find out, most of the tools on this list have a one-click feature. With an Easy-to-use interface, these tools can help relearn your new tires in no time. First, put the vehicle into the P position and this will allow your vehicle to enter relearn mode. From there, turn the ignition switch to ON, press Set/Ctrl to enter relearn mode and wait for the signal from your vehicle. Usually, your vehicle will inform you it has entered relearn mode by blinking the turn signal three times and beeping the horn twice. After that, the second step is to read the tire pressure information. Start with the front wheels and hold the TPMS tool up to the tire valve, click the power start button. TPMS reset tire pressure monitor sensor tool. When the tire pressure has been read successfully, your horn should beep twice. After you have completed all the tires, your car should signal by blinking the lights three more times and beeping the horn. Every year a new line of vehicles arrives with more features and functions than the past. Some features remain a consistent feature to remain legal and keep up with safety standards. TPMS is a smart way your vehicle ensures your safety without the driver even noticing. It is important to keep the tires correctly inflated to reduce the risk of accidents, skidding or an exploding tire. Although our vehicles are now set up with these advanced services, it is important to continually check that everything is in working order. 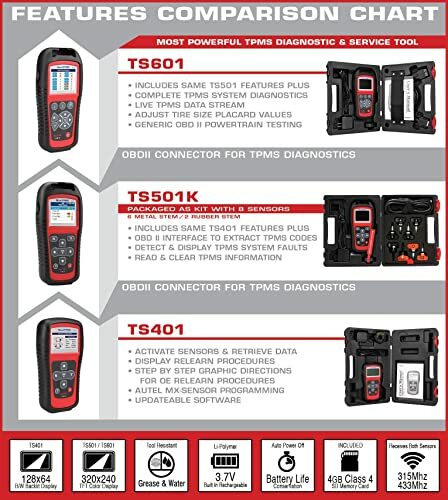 Our team has outlined the top 10 TPMS reset and relearn tools, so hopefully, the final decision can be made with ease. Now it’s time for you to make the decision for yourself. Our advice to you is to always double check the compatibility of your vehicle with the tool before purchase. This can be done by using our review and checking the compatibility or double checking with the tool manufacturers. Finding the perfect match for you shouldn’t be stressful or cost you too much money. We know that changing tires can be a pain. With one TPMS reset tool, you will have the power to reprogram new sensors and avoid excess tire costs. So today is the day, find your tool and get started.